A schematic repre­sen­tation of the Milgram Experi&verbar;-ment, which explored the power of the urge to obey au­thority. 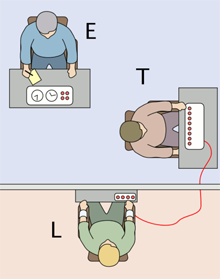 In the experiment, devised by Yale University psychologist Stanley Milgram, and first conducted in the early 1960s, an experimenter (E) instructs a test subject (T) in the training of a learner (L). The experimenter plays the role of an authority figure. The test subject plays the role of a teacher or trainer. The learner is an actor separated from the experimenter and test subject by an opaque screen. In the experiment, T is instructed to apply a series of electric shocks to L whenever L makes a mistake. The shocks escalate in power. In reality, L never receives any shocks at all, but emits a series of auditory responses that escalate from expressions of pain in response to the early, light shocks, all the way to screams of agony and finally death, in response to the most powerful shocks. If T becomes reluctant, E provides a series of verbal prods of escalating urgency. The experiment is intended to determine to what degree it is true that when instructed to do so by an authority figure, humans are almost universally capable of administering pain and harm at any level of severity. Replications of the experiment yield fairly uniform results that have been interpreted to mean that humans do exhibit this capability. However, given what we now know about the online disinhibition effect, one important question about this result does arise. That question involves the asymmetry of immediacy in the E/T and T/L relationships, which could account for the difference in the ability of E to influence T through in-person commands and the ability of L to influence T through screams of agony heard through the screen. It's possible that a remote E, having to overcome the effect of minimizing authority identified by Suler, might be unable to compete with T's reluctance to continue shocking L. It's also possible that a more immediate connection to L, through video or perhaps a convincing F2F simulation, might cause L's influence over T to dominate over E's. Image (cc) Expiring Frog, courtesy Wikipedia. As we saw last time, toxic conflict in virtual teams can arise from the nature of the virtual environment, because in the virtual environment, we sometimes engage in behavior that we self-inhibit when we interact face-to-face (F2F). One factor contributing to this phenomenon is that the virtual environment supports only a weakened form of the connection between our personhood and our actions. In his study of online behavior, psychologist John Suler calls this mechanism dissociative anonymity an element of what he calls the online disinhibition effect. Suler identifies another mechanism that he calls minimizing authority. Briefly, in the virtual environment, differences in personal status are not as evident as they are F2F, which can encourage behavior in the virtual environment that would be rare F2F. A familiar example is the stream of sometimes-disrespectful email messages that CEOs receive from people all through their organizations. Minimizing authority contributes to the online disinhibition effect by suppressing the inhibitions people have about addressing the CEO, and in what manner they address him or her. Within virtual teams, minimizing authority has analogous consequences. Here are three examples. An effective facilitator can impose order F2F with presence alone. Sidebars and interruptions are rare. In the virtual environment, especially one that lacks video, facilitators have much more difficulty maintaining order on the basis of presence, because projecting one's presence is difficult. Muting everyone except the recognized contributor does help, but the meeting pays a price for this in terms of spontaneity and the inability to interrupt legitimately, as one might do for a process question. Although project managers generally lack formal authority over the members of teams they lead, they do have some authority within the project context. They can use that authority, their personal relationships, and their personal presence to craft a microculture that enables team success. But in the virtual environment, the phenomenon of minimizing authority makes this more difficult. Progress suffers. on the basis of presencein the virtual environment also affects those with authority, whose perceptions of their own authority are based, in part, on their experiences of others' perceptions of them. In the virtual environment, since the perceptions of others are affected by minimizing authority, those with authority sometimes see themselves as less authoritative. Moreover, when others behave in a manner that in real life would be viewed as challenging to authority, those with authority can experience a feeling of being disrespected. This can be upsetting, leading to misjudgments, miscommunications, and misbehavior on the part of those with authority. Would you like to see your comments posted here? rbrenlYuVtfNdZsciHuciner@ChacExjKFGDolbEFyMcroCanyon.comSend me your comments by email, or by Web form. I offer email and telephone coaching at both corporate and individual rates. Contact Rick for details at rbrenhEhuWTAokadUJMCkner@ChacUYVuDQsVQJhnhHrQoCanyon.com or (650) 787-6475, or toll-free in the continental US at (866) 378-5470.